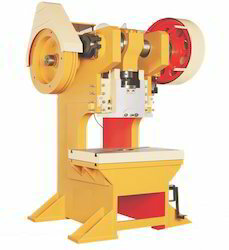 Providing you the best range of c type power press machine with effective & timely delivery. Frame: The frame is of all steel construction, fabricated from rolled steel plates with suitable cross ribbings. Presses up to 30T will be supplied with C.I. legs. Proper alignment of the frame is ensured by machining. The structure is designed for perfectly balanced distribution of stress over the cross section eliminating deflection & vibration, in result increased tool & machine life. Clutch: The clutches of pin/rolling key-type and well supported with high rigidity. The Clutch is made of special alloy steel, the pin / rolling key is manufactured from W.P.S. / EN24 material & with proper heat treatment to ensure trouble free long life & give continues stroke for mass production. Crank Shaft: The Crank shaft is made of special alloy steel with precisely machined to grind finish having closed accuracy and fitted in bronze bushes for smooth working, longer life with consistent performance. Adjustable Stroke: The unique feature of adjustable stroke enables the press to perform all kinds of operations by employing short stroke for blanking and forming operation. Gears: Gears are of steel cast or fabricated. Gear teeth are generated by precision hobbing machine.